To hide widgets in Editor, just select the widget(s) you would like to hide, then right-click on any one of them and select 'Hide' from the menu (you can SHIFT click to select more than one widget if you need to hide more than one at a time). 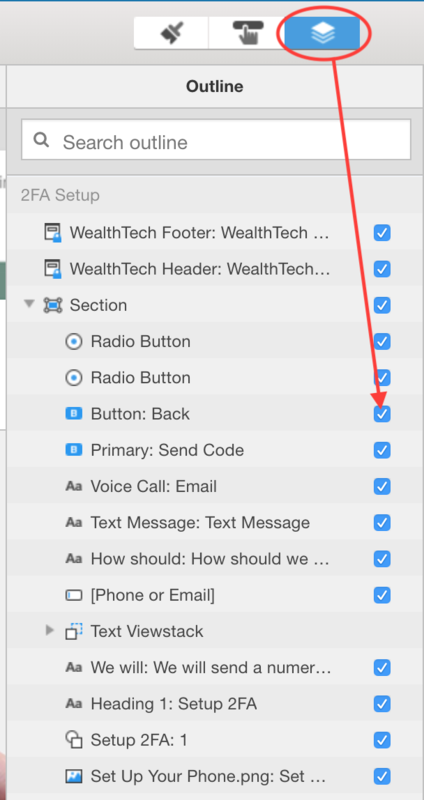 The check boxes in the Outline panel toggle the visibility of widgets. The keyboard shortcuts for showing and hiding are [Ctrl] + [Shift] + [H] (Windows) and [Cmd] + [Shift] + [H] (OSX). This highlights an important difference between Studio and Editor. The checkboxes in the outline and the 'hidden' property in Studio property panels both control the same piece of data. In Studio, checking the checkbox for 'hidden' just sets the default visibility of that widget when a stakeholder visits that page using Player. The checkbox does not affect visibility of the widget in Studio. In this way, Studio is not WYSIWYG. Editor, on the other hand, is WYSIWYG, so if you hide a widget in Editor, it disappears in Editor and sets the default visibility when a stakeholder visits that page using Player. Similarly, switching the visible view in viewstacks in Editor is WYSIWYG whereas switching the visible view in a dynamic display in Studio only affects Studio (not the default view seen by stakeholders in Player).